I'm not going to comment on the overall Yahoo Food frankensite that launched yesterday -- that's not my gig and besides, after Bambi Francisco does a video podcast on any given topic, there's really nothing left to say. 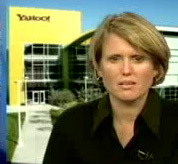 But as for the alleged "Local Dining Guide" component of Yahoo Food, well, let's just say it is poised to do to CNET's Chowhound what Yahoo did to Google, namely nothing, except to kill itself slowly from sheer suckage. 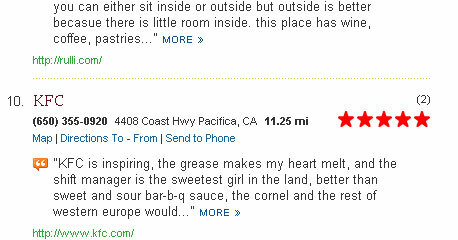 They just took the boring reviews from Yahoo Local and mashed them up with a map. But in the most horribly inept way imaginable. The map only shows 10 restaurants at a time, and if you try to use your scroll wheel to scroll down the Web page to actually view the list of restaurants, the map thinks you want to change zoom and so you end up with a view of North America from space. The best part is when you sort by rating, you end up with, I kid you not, KFC as one of the top 10 restaurants in San Francisco. Number one? The local offices of the Hotel Employees and Restaurant Employees union (who knew Mike Casey was such a chef). I'm amazed they link so prominently into the dining guide from the front page of Yahoo Food. Bottom line: stick with CNET Chowhound, where you get everything you could want to know about restaurants, except for the really juicy important stuff.